Oh, why do we like to be beside the seaside? We have long taken it for granted that a lungful of sea air and getting sand between our toes is good for our wellbeing. But does being by the seaside really make a difference to health? The Victorians clearly thought so, building beach huts and promenades at beautiful locations along the UK coastline. But even the latest census data reveals that people living near the sea are happier than those inland. A new study at the University of Exeter is trying to find out - and if we can harness the benefits for people living miles from the sea. "We know that city living can really affect our mental health and wellbeing, and undermine it, but also our physical health, particularly through the release of stress hormones and exercising less," says Dr Mathew White, who is leading the project. "What we're really interested in doing is reconnecting people with the natural environment, to try and reduce that stress." The problem with studying the natural world is that it is highly complex - making teasing out the relevant factors from a seaside scene particularly tricky. To solve this, scientists have tried to recreate specific parts of the coastal environment in the lab. That's how volunteer Jo comes to be in a small, windowless room with only an exercise bike and a video of the beach for company. She is taking part in an experiment at the European Centre for Environment and Human Health, looking at the mental and physical health effects of "blue", or watery, environments. Abi Scott from the University of Exeter Medical School is one of the project's researchers: "We want to see if we can increase someone's mood and get them exercising for longer if they're cycling in a natural environment," she told the BBC. The current study is already building on the promising past results. One study found that people's mood increased more when they were shown a blue environment, compared to green, urban or a blank wall. A second study discovered that if you ask people to cycle on an exercise bike for as long as they want, those with the lowest mood and self-esteem cycled for a much shorter time than happier volunteers. The new study combines the two - asking whether people with a low mood will feel happier (from the blue environment) and as a consequence, cycle for longer. This will reveal whether being in a blue, seaside environment can turn people's low mood around and encourage them to be physically fitter in the process. "The sea air and sea bathing together were nearly infallible, one or the other of them being a match for every disorder of the stomach, the lungs or the blood. They were anti-spasmodic, anti-pulmonary, anti-septic, anti-billious and anti-rheumatic. Nobody could catch cold by the sea; nobody wanted appetite by the sea; nobody wanted spirits; nobody wanted strength." Volunteer Jo is still furiously pedalling along, with the recorded sounds of crashing waves pouring out from the speakers behind her. Not many people's idea of relaxing. But if the laboratory study turns out to show a real effect on mood and the desire to keep cycling, then the team have to ask: what is it about images of the sea accompanied by the sounds of canned waves that's making all the difference? Dr White is investigating all possibilities, "Is it the pictures of the sea, the waves moving, the beach environment? Is it the sounds, the beautiful crashing waves, the seagulls and so on? Or is it a combination of those things together?" he says. So far, the sound of the sea seems to be particularly evocative and influential in how people feel. "Funnily enough when you ask people what they're listening to, it might be a recording here [in Cornwall] but they're imagining somewhere in the Seychelles, so that's maybe what's going on in the brain..
"You see and hear one thing, but you're perhaps imagining other things." 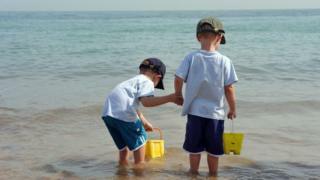 The notion of the seaside environment allowing people's minds to wander seems to be supported by early unpublished results from a brain imaging study. "What we're finding, if anything, is a lot less activity in the brain when the sea is being shown [compared to green spaces]," says Dr White, "which tells us that it's possibly less stressful and more familiar to the core human being." Although the seaside is by no means being touted as a cure-all for depression, the idea is that over time small incremental changes could add up to a big change, perhaps even big enough to help people living with depression. However, Dr Mike Marriott, a clinical psychologist at Nottinghamshire Healthcare NHS Trust urges caution before drawing conclusions about treating complex conditions like depression. "Anything that can help to give people with depression a different experience by lifting their mood temporarily might well aid them in overcoming their difficulties," he says. "But a complete recovery usually comes when people are able to see changes in all the other areas of difficulty as well." So far, the effect of the sea on health has only been investigated on UK volunteers. In 1757, Dr Richard Russell wrote about the therapeutic benefits of seawater. "You need to drink seawater, bathe in it, and eat all forms of seafood in which all the virtue of the sea can be found," he wrote. He thought it could relieve conditions as diverse as flatulence, leprosy, gonorrhoea and cancer. The 18th Century saw the invention of bathing machines and the first swimsuits. But it was in the 19th Century that seaside resorts really took off, initially as destinations for the upper classes who wished to reap the benefits of the sea air and saltwater bathing. With the spread of the railways and introduction of bank holidays, the working classes visited the coast in their droves and the British seaside holiday was truly born. But Dr White has already had interest from the Netherlands to Hong Kong to expand the study further. "Around the world over 60% of the people live in coastal margins. So we think that's not a coincidence that most of the people do live by the coast," he told the BBC. Explanations for this range from the practical - the sea provides a source of food and more recently, access to trade - to more controversial theories such as the aquatic ape hypothesis. But strong cultural associations may also be at play in improving our sense of wellbeing. From the Victorians onwards, the allure of the beach for the British has been one of fun, sandcastles, windbreaks and dads awkwardly changing out of wet swimwear. By expanding the research worldwide, they hope to discover the whether cultures without that tradition and those in landlocked nations are affected by seaside scenes in the same way. If so, there are wider implications for urban planning policy. "We've been contacted by countries with very small coastlines, such as Germany and Switzerland, who are quite worried. Are they missing out on health benefits?" says Dr White. "So one of the questions we're quite interested in is if there is an effect of large lakes, or does it have to be the coast?" The research could also encourage local councils to increase protection for lakes and rivers and improve coastal access so that more people can feel the benefit. They are even investigating the benefits of virtual reality. "We're running trials at the moment in a dental surgery where half the patients are given the option of experiencing a virtual beach environment that they can walk about in for 30 minutes. "We're hoping to find that if their stress levels are lower, which will also make the dentists feel happier and the operations go more smoothly," says White.